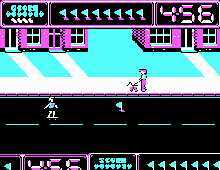 Awesome Earl in: Skate Rock is a fun CGA side-scrolling skating game that is reminiscent of Atari?s classic Paperboy arcade game. Nothing extraordinary here, but solid gameplay should keep Paperboy fans happy. The graphics are sharp, and the action is smooth even with limited 4-color palette of CGA. There are many obstacles along your path, ranging from the mundane (garbage cans, other people, etc.) to the surprising (well, I?ll let you find out what ;)). Overall, a solid action-oriented game that?s well worth a look, although not a realistic depiction of the sport by any means.